Xiaomi has a whole range of mobile VR headsets now, the best of which is the Xiaomi Mi VR, its Gear VR-alike which comes as a full headset with a bundled controller. You can pick up one of those up for $29 – but maybe you want to shave off a bit more money and check out the smaller, lighter $24.99 Mi VR Play 2? This is Xiaomi's Daydream View-style headset, with a very similar design and finish. Our advice? Sure the VR Play 2 is easier to get going with – just plug and play – but you're better off paying slightly more money (if your phone is compatible) or else just going with another super cheap, super basic VR headset. Side by side with the Daydream View and the Mi VR Play 2 looks almost identical in shape, size and feel. The front of the headset simply pulls away to let you push in your 4.7-inch to 5.7-inch phone (iOS or Android), so it's not as fancy as Daydream in this respect. It does have a pusher button on top, which works fine, plus a grooved line to help you centre your phone and grilles for cooling it, so it's not without merit. Overall, it is light at 183g and comfortable with a soft fabric finish, a curved shape and padding for your face, unlike the first Mi VR Play. A little light gets in from the sides of the headset, near your ears, but not nearly as much as can get in from the Daydream around the nose – depending on the shape of your nose and face, we've found. Xiaomi says that this isn't designed to be used with regular glasses. The strap secures with velcro – don't throw away the box with it in – but doesn't have a strap which goes over the head, meaning the whole thing rests on your nose. It's fine for a viewer this light but could get annoying after a long session. 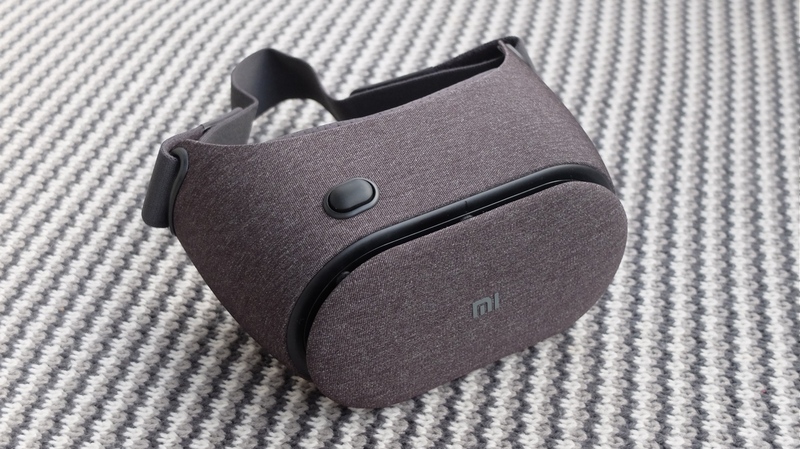 The Mi VR Play 2, like its predecessor, is designed to be used in China and with the Xiaomi VR app store. As such, all the instructions are in Chinese, while the QR code on the manual insert didn't work on a non-Xiaomi Android phone in our testing. You'll also have to download the Xiaomi VR app via your browser, from sites like this one, rather than a nice Google Play download. The official field of view is 93 degrees, which is more than the first headset's 75 degrees, but from what we could see from our time with the Play 2, that feels generous. The overall picture from the aspheric optical lenses is not up to scratch when compared to Daydream or Gear VR and at times experiences and games can look distorted. What can we say? It's $25 and, again, you get what you pay for. Outside China (where it's even cheaper at around $14) this isn't the mobile VR headset to slay the quality, affordable competition from Samsung and Google. And because it's Xiaomi, you will have to jump through a few hoops to get started. Still, the design offers some improvements over the last Mi VR Play, so maybe next time, Xiaomi will nail it.